Of all the events comprising England's social season - including Henley, Royal Ascot and Wimbledon - only Cowes Week allows you actually to take part rather than just be a spectator. Indeed the spectating at Cowes must be very dull, while hurtling round a Solent jam packed with racing yachts gives you a buzz which no amount of strawberries and cream can compete with. 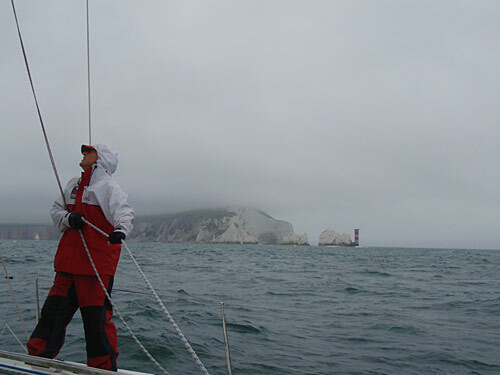 What are the Needles doing in a Cowes Week course? The proviso for competing at Cowes is that you do have to be able to sail a complicated and lengthy course, set with the fastest boats in your class in mind and which you only learn of 10 mins before the start, by the 6pm deadline. Otherwise the officials go home and you get no result. Not good for the bar banter later. So racing Nisida into IRC Class 1 (the top class - we're a big boat) is a challenge. When the entry list comes through I was appalled to see we were racing against TP52s including Rio - Charles Dunstone's funded boat crewed by the guys who should comprise the UK America's Cup team. Plus other scary sounding boats. Clearly with a crew which changed every day and which had more girls on board than the rest of the class put together wasn't going to be challenging for top honours - but what we didn't want was to sail the course on our own every day or, worse, fail to finish within the time deadline. But we were lucky - also in our class was Orca - a Class 40 which rated more than us but which we knew we could match for speed. And so it indeed proved as we spent the whole of Cowes locked in battle with Orca while the rest of our class sailed their own races ahead of us. And this battling did get us better and we did get closer to the rest. And we finished comfortably by the 6pm deadline every day - and indeed also sailed the correct course which was more than some of the others managed. 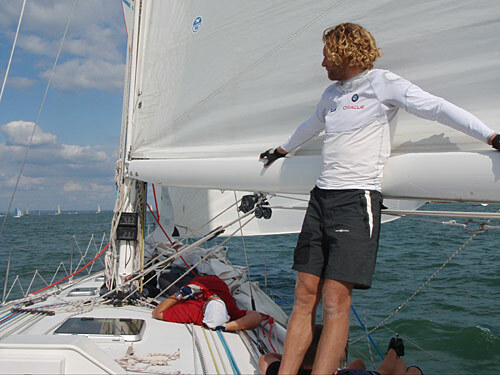 And getting round these courses really did feel like an achievement when they were typically over 40 miles long, took us well out of the Solent in both directions, and comprised up to 6 spinnaker hoists and drops - and even, by the end of the week, two peels. (By comparison in the whole of the Fastnet they only hoisted a spinnaker twice). We finished 14th out of 19 in our class which we were delighted with. And we loved introducing new LCSC members to Nisida and showing how you can race that far in a day. Nisida is a challenge to race 'round the cans' and everyone had to work really hard to get us to the finish (and the bar) in time. 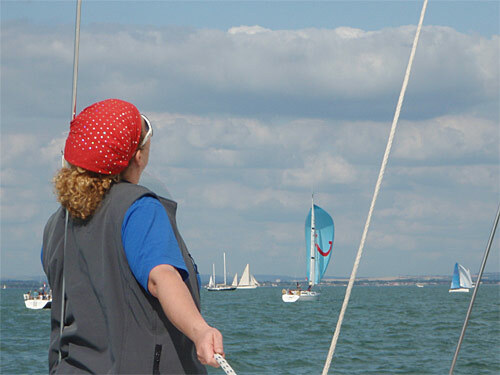 It only takes two boats to make a race but it does take a lot more than that to make Cowes Week so special. And that was the other great aspect of this year's Cowes Week. There were Corinthians everywhere. Back in 2001, my first Cowes Week, there were no LCSC boats (I sailed on someone else's) and very few of us around at all. This year you couldn't move on or off the water without coming across Corinthians. From Louise Allheusen - racing on Yeoman - hailing us before the start with my quote on Tom's LCSC blog, to battling against a (very) foul tide to the finish on the last Friday with Martin R-C on his Sunsail to one side and Jenny Scott on a 40.7 on the other, to the club fireworks party on Nisida where I joked with the boat moored outside us that we were doing an inclination test - so full were the decks of partying people - it was fabulous!